A year ago, we were all digesting the Miller judgment of the UK Supreme Court. The Court ruled that an Act of Parliament was needed to authorise the triggering of Article 50. Today, the Irish Supreme Court has been considering what questions to refer to the European Court of Justice following its earlier O’Connor ruling concerning the effects of Brexit on the operation of the European Arrest Warrant system. Brexit has generated some interesting litigation but with mixed results. Test cases that simply float abstract legal propositions have often failed to land their punches, whereas claims that focus on concrete losses of rights or changes in legal status have had greater traction. The case brought by Gina Miller is a useful starting point. Although the litigants were trying to test a legal proposition – indeed, it was originally a post on the UK Constitutional Law Association blog that floated the idea that an Act of Parliament was necessary before Article 50 could be triggered – the claimants’ lawyers skilfully categorised the loss of rights that would occur once the UK left the EU in a way that made it clear to the judges hearing the case that their complaints were real. What the Miller case left open was the question of whether an Article 50 notice was revocable. It is a point that has been discussed in a recent European Parliament report and on blogs and other legal writings. It wasn’t necessary for the UK courts to rule on the point in the Miller case and the arguments proceeded on an assumption that the notice was not revocable simply to allow the complainants argument to be tested. Other subsequent litigation, however, has attempted to raise this question more directly, often with a view to eliciting a definitive view on the issue from the Court of Justice in Luxembourg. Nonetheless, getting these cases into court has proved rather difficult. One reason these cases prove difficult is when they seek to test a legal proposition without it being completely clear that there is an underlying dispute or legal problem that requires an answer to the legal proposition being tested. Back in January 2017 – and before the triggering of Article 50 – the barrister Jolyon Maugham QC and the Good Law Project crowd-funded a legal challenge to be brought in the name of a group of politicians before the Irish courts naming Ireland and various EU institutions as defendants in a complaint that the Article 50 process had in fact already been triggered. It was claimed that as the EU was then refusing to formally begin negotiations there was a breach of the Article 50 procedure. In that light, the issue of the revocation of an Article 50 notice was raised. 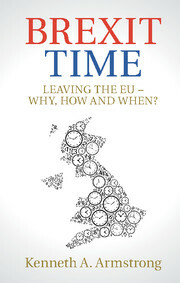 Maugham himself described the case in the following way: ‘Strip away the complexity and it looks to find an answer to a simple question: do we have the option of changing our minds about the wisdom of Brexit?’ Of course, an answer to this question is only necessary if you think the referendum got it wrong in the first place. By the end of May, the complainants had decided to discontinue the case. One important factor was timing, with any reference to the Court of Justice unlikely to occur until a case got to the Irish Supreme Court. But even if the case had got to court it is not entirely evident that the Irish courts would have considered that they had jurisdiction to hear the case or that a reference to Luxembourg on the revocation issue was necessary. More recently, a mix of Scottish MPs, MSPs and MEPs sought to bring judicial review proceedings in the Scottish courts. The case was again supported by Jolyon Maugham and the Good Law Project and was also crowd funded. The case was brought with a view to obtaining a reference to the Court of Justice on the revocability of the Article 50 notice. The Government, however, argued that there was no justiciable issue as it had no intention to revoke the Article 50 notice. In a short and pithy ruling on 6 February 2018, Lord Doherty in the Court of Session agreed with the UK Government that the issues raised were hypothetical and academic. As the claimants had no real prospect of success, permission to proceed with an application for judicial review was refused. However, an appeal to the Inner House of the Court of Session is being sought, with counsel for the petitioners contesting Lord Doherty’s evaluation of the claim as hypothetical and academic. Other attempts to bring judicial review proceedings have also run into problems. The Single Market Justice campaign fronted by a Leave campaigner (Adrian Yalland) and a Remain campaigner (Peter Wilding) attempted to bring judicial review proceedings on the question of whether an Act of Parliament was necessary to authorise the UK’s triggering of its withdrawal from the European Economic Area (EEA) Agreement under Article 127 of that agreement. Absent a formal withdrawal from the EEA, the claimants hoped to keep the UK in the Single Market. However, the application was dismissed as being premature given that the UK Government had not, at the time, set out its position on whether it wished to stay in the Single Market. But if these public interest test cases brought by politicians and advocacy groups have failed to build on the momentum of the Miller case in order to gain legal leverage over the mechanics and procedures of Brexit, it is the impact of Brexit on the real lives of individuals that has fuelled a more recent bout of litigation. Whereas the Miller case proceeded on the assumption that Article 50 would not be revoked with the consequence that the loss of rights – including EU citizenship rights – was apparently inevitable – the bullet hits the target as lawyers for Miller argued – the Dutch District Court has this month considered whether that loss of rights is actually inevitable. There has been some discussion of the issue of whether EU citizenship rights are ‘acquired rights’ on legal blogs and in a report from the House of Lords European Union Committee. The Dutch court has referred two questions to the Court of Justice on this question. In essence, the Dutch court wants to know if the loss of rights is automatic, and if not, what restrictions there might be on such rights. The case is being brought by British citizens and is supported by the group Brexpats – Hear Our Voice which is being assisted by Jolyon Maugham. As a result of today’s activities in the Irish Supreme Court, the Court of Justice will also shortly receive a reference on whether a national court can refuse to implement a European Arrest Warrant if that entails surrendering an individual to the jurisdiction of UK courts where that might lead the individual to serve a term of imprisonment in the UK after the UK leaves the EU. The Irish High Court had granted an order to execute the arrest warrant, but an appeal was sought to the Irish Supreme Court on the basis that it raised an issue of EU law that required an interpretation from the Court of Justice. In its judgment on 1 February 2018, the Supreme Court accepted that the issues raised were not hypothetical and that it was appropriate to give leave to appeal in order for a reference to be made to the Court of Justice. Amidst these litigation successes and failures there is a wider point to make. As the response to the Miller case from certain quarters of the British tabloid press serves to highlight, litigation can be seen as an attempt to subvert the outcome of the June 2016 referendum. Although the case had nothing to do with the legality of the referendum itself or its outcome, one perception of the move to give parliament the decisive say on the triggering of Article 50 was that the litigation was designed to alter the political course that had been set by the referendum. If that was the intention behind the litigation, it failed. But it drew attention to a sense that a certain section of society might seek to use law and litigation to direct, if not trump, politics. As I argue in Brexit Time, if the public was concerned about the power of political elites, it might equally have been wary about legal elites using law and litigation to change politics. All that said, the failure of cases that sought to raise the revocation issue may suggest that abstract ‘public interest’ litigation has its limits. Indeed, the cases from the Dutch and Irish courts may instead point to a more traditional role for courts, namely as a mechanism for the concrete protection of the rights of individuals. The boundary between these types of cases is far from clear as the Dutch case vividly illustrates. Nonetheless, success may depend on making a broader public interest bite on the particular circumstances of individuals and changes in their rights or legal status. Previous Previous post: Time For a Re-Think? Next Next post: Does the Validity of the Article 50 Letter Depend Upon the Existence of a Formal ‘Decision’?